Pennsylvania is officially known as the Commonwealth of Pennsylvania and unofficially known as the Keystone State. 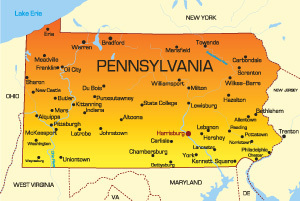 The population of Pennsylvania is nearly 13 million as it is the 6th most populous state in the United States. The capital city is Harrisburg but the largest city is Philadelphia, which is home to over 1,500,000 people. The bordering states are Ohio, New York, West Virginia, New Jersey, Rhode Island and Massachusetts. Major highways servicing the state include The Pennsylvania Turnpike, I-80, I-90, I-79, and I-81. Notable universities in the state are The University of Pennsylvania and Penn State University. Attractions like the Philadelphia Phillies and the Pittsburgh Steelers bring in fans and tourism from across the nation.